Templar Titan Inc. maintains in its ranks and extended network the world's finest instructors and subject matter experts (SME). We cover a broad spectrum of beginning, intermediate and advanced military, para-military and law enforcement training services and needs. Templar Titan is capable of engineering client, or mission specific training blocks designed to enhance the capabilities of groups small or large, advanced or beginner. We have the capability to train large and small units in beginner and advanced soldiering techniques, tactics and procedures (TTP) assisting commanders in the standardization, integration and sustainment cycles as requested. Our training is progressive and scalable to desired talent levels, commander’s vision, or overall enabling objectives. We follow the axiom crawl, walk, run in delivery of the training blocks to ensure understanding, grasp of learning objectives and to ensure growth in proficiency. Templar Titan Inc. has the capability to establish training cells for governments, corporations and the private sector engineering desired skill set development in incremental stages, or in straight shot stints for individuals, or groups. We can deliver services to anywhere in the world, set up training sites in the U.S. or architect a mix of both. Our Mobile Training Teams (MTT) are comprised of seasoned veterans who have tested their skillsets on the battlefields, in urban and rural environments and within emergency/disaster scenarios globally. Templar Titan can also teach the required curriculum for a host of corporate security concerns, from systems design and integration to facility security plans (FSP), perimeter and access control to vetting, selecting, training and retention of security professionals. 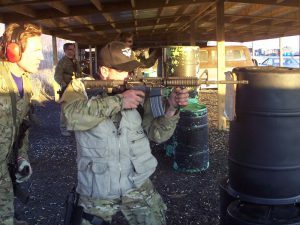 We can craft protective security detail (PSD) and executive protection development and sustainment training, to include field exercises with a mix of classroom and range time. We also have leadership, motivational and team building training. Whatever your training requirement or needs may be, Templar Titan can support you to meet your objectives.